About 19:30 net control takes announcements, questions, and comments, and accepts checkins from members and non-members alike. Net control duties for this net are passed around between interested volunteers. If you are interested in running this net, all you need to do is get in touch with the current net control co-ordinator and find a date that hasn’t yet been filled. You should have a copy of the Script, listed below, to read as part of being a control operator. The Seattle Auxiliary Communication Service meets on the air at 7:00PM local time each Monday. They discuss ACS business, take emergency traffic, and take checkins. The net usually lasts about 20 minutes. The Boaters’ Net started in 2006 with 17 members. On any given day there are 20-30 check in’s. About 50-60 folks listen every day and during inclement weather over 150 listen in. A number of members check in via Echolink if they are out of the repeater’s range. The net geography goes from Yelm in the south to San Juan Island in the north. 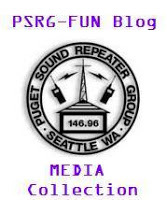 The Net moved to the PSRG repeater from the Gold Mountain repeater around 2012. Come on by and let Chris know what your weather guesser says!